Released by Oticon on March 12, 2019 the Oticon OPN S 1 Rechargeable falls under Oticon`s premium technology level within the Opn S Rechargeable family and is Oticon's first ever lithium-ion powered hearing aid. The Oticon OPN S 1 Rechargeable hearing aid has 64 channels and 4 customizable programs, and that gives it the flexibility to digitally process sound in a way that sounds natural, and can also be adapted to the particular listening environment of the wearer. The OPN S 1 Rechargeable is powered by a built in lithium-ion battery, which, when powered overnight, reliably delivers 24 hrs of power to the hearing aid. With a maximum potential gain of 61 SPL, the OPN S1 Rechargeable is suitable for individuals with mild to severe hearing loss. With its discreet RIC (receiver in canal) style, the OPN S 1 Rechargeable sits comfortably behind the ear and is hardly noticeable to the wearer or others. This hearing aid is available in 7 color choices as shown below. If you have questions about the OPN S 1 Rechargeable that you don`t find answered on this page, or are looking for specs on this device, you might want to check out the downloadable documents (below), visit Oticon`s website, or feel free to give us a call at 800-731-6794. How do OPN S differ from the previous OPN hearing aids? 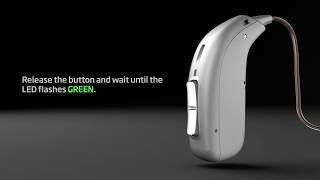 The Oticon OPN S1R is Oticon's first hearing aid powered by lithium-ion batteries, which have become the gold standard in reliability. Aside from that, the biggest benefit to upgrading to the OPN S (according to Oticon literature), is a 15% improvement in speech clarity in noisy environments. While this may seem like an unremarkable or incremental improvement, it is important to note that Oticon had set the bar very high with the earlier Oticon OPN hearing aids, which were already among the highest-rated hearing aids for performance in background noise. Opn S also brings improvements in feedback prevention, to stop whistling noise before it starts. Is there a mobile power pack available for these hearing aids? At this time there is not- so plan ahead and make sure your hearing aids are charged! If you get in a bind and don't have much time, a quick 30 minute recharge will get you 5-6 hours of power. 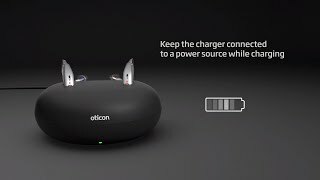 If you need power on the go, you can use Oticon’s charger with a car adapter. Oticon expects the li-ion battery to need replacing every 3-4 years, and this can be done with a simple and quick visit to your local provider's office (as opposed to many manufacturers who require you to send your hearing aids to them for service). How do I turn the OPN S1R hearing aid on and off? To turn this hearing aid only, simply press and hold the lower button for 2 seconds, and you will hear a startup jingle to confirm the aid has powered on. To turn the hearing aid off, hold that same button for 3 seconds. You can simply take your hearing aids off at night and seat them in a bedside charger and wake up to fully charged hearing aids with plenty of power for the whole day ahead. Watch how a full day is powered with Oticon rechargeable hearing aids. A full day’s power – Every day! Oticon rechargeable hearing aids are available with a stylish state-of-the-art charger and long-lasting rechargeable batteries. 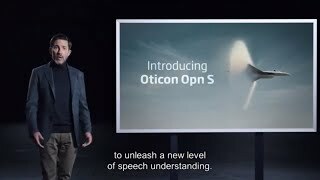 Now, Oticon Opn S takes it to the next level! Oticon Opn S breaks a law of physics and delivers further improvements in speech understanding and listening effort. Fuelled by the new, advanced Velox S™ platform, Oticon Opn S takes the open sound experience and unique benefits of BrainHearing™ to new grounds. This easy-to-use wireless charger is based on inductive technology and enables reliable and fast charging in just 3 hours for a full day of hearing, including streaming. A quick recharge of 30 minutes gives an additional six hours of power. If a replacement battery is needed, the lithium-ion battery is easy to replace in the hearing provider's office- no need to send in for service. VERIFIED BUYER | Ardsley, NY	? It is hard to tell the difference in hearing as a result of wearing the hearing aids. However there are no negatives like ringing in the ears. The aids are moderately comfortable. My left ear is more comfortable than my right, but i believe I am still getting used to them. The overall experience of working with my audiologist and receiving and fitting the product was excellent. Note this is my first time wearing hearing aids, so i have no measure of comparison.